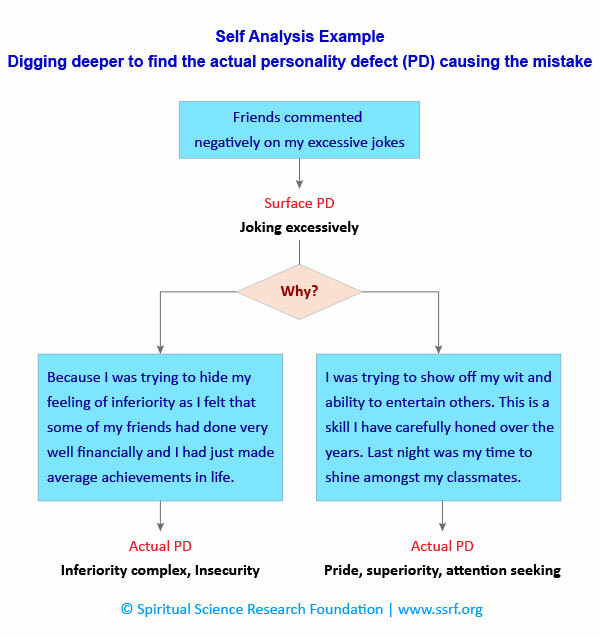 In this chapter (following up from the last chapter) we continue to explain how to fill out the self-analysis tool, which is the PDR chart. In the last chapter we focused on understanding the intensity and impact of a mistake. In this chapter we explain how to analyse the root cause of an incorrect action or reaction. The next time you recognise that you have made a mistake or someone else has pointed one of your mistakes out to you – it provides a good opportunity for introspection and analysis of oneself for increased self-awareness. The mistake could be big or small. Yet either way, it presents an opportunity to better understand one’s mind. The analysis would be focused on, ‘What personality defect of mine caused such a mistake to happen? To arrive at the root personality defect responsible for a mistake, one has to go on analysing by asking questions to oneself as to why we made that incorrect action or why we had that incorrect reaction. Then one needs to document one’s analysis in columns G, H, I & J in the self-analysis tool, which is the PDR chart. Below is an example snapshot of a self-analysis chart to document the mistakes that one has made. In column G, we have provided two options in categorising a mistake, i.e., due to one’s ego or just a personality defect. 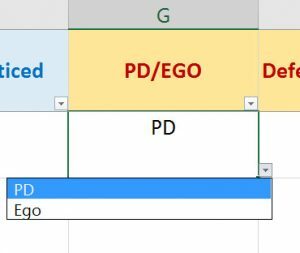 Based on what we choose in the drop down in column G, in columns H, I and J, you will be presented with a list of ego manifestations or personality defects to choose from. So how do we decide if a mistake has occurred due to a personality defect or is the result of one’s ego manifesting? Actually all PDs arise from ego. 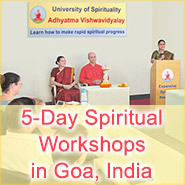 Ego is something that is more ingrained while PDs are more superficial manifestations of ego. So to decide whether a mistake has occurred due to a PD or an ego point ask yourself how engrained the defect is. If it is a random case of a defect manifesting then choose PD, however if it is a strong personality trait then choose ego. Refer to the worksheet that lists various personality defects and ego points as a guideline to help understand how you can classify a mistake. The next step is filling column H, I and J after understanding/analysing what were the personality defects or ego points that contributed to the mistake. In section 2.2 to 2.6 given below we explain how to go into this analysis in detail in order to fill out the chart correctly. 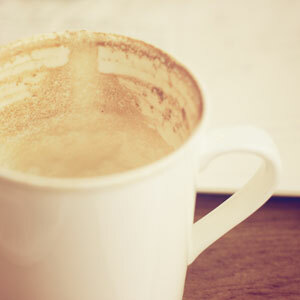 Let’s say that you have become aware that the following mistake has occurred – “I did not wash the coffee mug after having coffee”. The following are some possible answers that you may get. The analysis of the root defect will depend on what the predominant thought was (in your mind) behind the inaction of not washing the coffee mug. In the following table we illustrate how the analysis can be carried out. As you can see depending on the thought behind not washing the coffee mug, you would need to fill out the personality defect related to the thought in column H, I and J. In this section we will go through the analysis of an incorrect reaction. Joanne has become aware of a reaction she was having. I was angry with my manager when he praised my colleague (Tina) instead of me. Depending on what was the thought that triggered the anger, Joanne will be able assess herself as to which personality defect was the cause of the reaction in her. 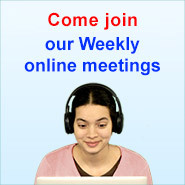 Incident: I was joking excessively when I met my school friends after many years at a class reunion. Some of them commented negatively on my excessive joking. It is important to note that we may feel that there is a combination of personality defects that contributed to a mistake. It is for this reason we have provided 3 columns (H, I and J) to list these defects/ego manifestations. In column H we would need to list the primary defect while in column I and J we can list the secondary defects/ego manifestations. For example, in the mistake – “I felt lazy to wash the dishes after dinner”. 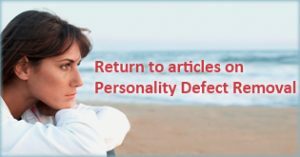 The main personality defect identified could be ‘laziness’ while a secondary personality defect contributing to why the mistake took place could be due to ‘procrastination’. 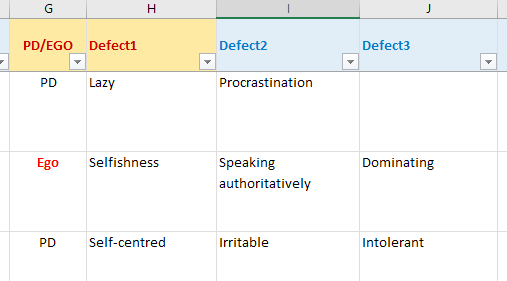 Accordingly, after choosing PD in column G, for this particular mistake one would fill Defect 1 (column H) as ‘Lazy’ and Defect 2 (column I) as ‘Procrastination’. If one cannot think of any other contributing personality defects one can leave Defect 3 (column J) blank. Please note it is mandatory and important that one fills at least one defect for each mistake.